Truly I tell you, if you have faith as small as a mustard seed, you can say to this mountain, “Move from here to there,” and it will move. Nothing will be impossible for you. Jalandhar Nayak seems like a very determined guy. 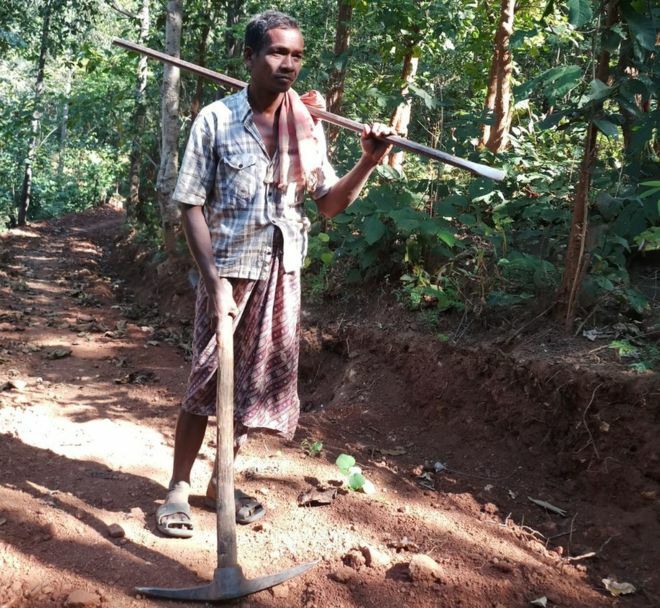 The 45-year-old father of three was basically just missing his three sons, who are students at a residential school in a town that’s about 10 km from the tiny, remote village in the eastern Indian state of Orissa in which he lives. That’s just a little over 6 miles, but the walk between the school and their home would take the sons three hours because they had to cross five hills. They couldn’t come home very often because of the difficult walk. 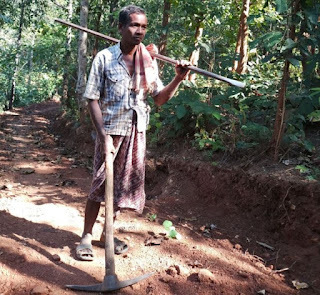 No one seemed very interested in building a road to Mr. Nayak’s village; they don’t even have water or electricity. So Jalandhar started working on a road himself. For the last two years, every morning he has taken his tools — a pickaxe and a crowbar — and headed out to work on his road. Two years of breaking rocks, leveling ground, moving boulders. Slowly but surely, his road started to take shape. One kilometer. Two. Day after day, hour after hour he worked on his road. Like I said, Jalandhar seems like a very determined guy. His determination, in fact, finally caught the eye of someone in the town’s government, who contacted him to say they would finish the road. They’re really impressed with his work. They say it’s good enough for a car to travel on. They’re even going to pay Jalandhar for the work he’s done. They should, since he’s finished 8 km of road. Over half. I love my son, but I don’t think I could build a road to his school. (In fairness, it is about 500 miles away…) Jalandhar’s determination and hard work are impressive and inspiring. He’s apparently also asking the town to run water and electricity out to his village. No word on whether he’s a plumber or electrician as well. Jesus famously told his disciples that if they had even the tiniest amount of faith, they’d be able to move a mountain. I don’t know about you, but that’s one of the toughest statements in the Bible to me. Jesus seems to be saying — no, he explicitly says — that if a believer has any faith at all then impossible things should become commonplace. Move a mountain? Done. That’s tough for me, I have to admit. A little flashier than Jesus normally is. It claims too much, it seems to me. Makes him sound like a TV preacher. There’s probably a good chance that Jesus thinks of moving a mountain because of a vision in Zechariah 14:4, where God stands on a mountain near Jerusalem and it splits apart to give the Israelites an escape route from their enemies. That doesn’t really help me though; in fact, to imagine that faith gives us the power to do something that only God can do is even harder to believe. I think, though, that I might have figured out the problem. The problem is that I’m working with a bad definition of faith. I’m thinking of faith as some inner quality that gives a person superpowers — maybe like the X-factor in the X-Men comics. Get your faith charged up enough and you’ll be able to do impossible things. Jalandhar Nayak, however, reminds me that faith isn’t like that at all. Faith is what makes you get up every morning and grab your pick. There’s a scene in The Last Jedi where Luke Skywalker is training Rey. He asks her what she thinks the Force is, and she says it’s a power that Jedi use to do impossible things. Luke tells her that “everything [she] just said is wrong.” He tells her instead to reach out, to feel the Force. It isn’t something a person uses to do amazing things; it’s there, and you can either recognize it or not. The point is that Rey has misunderstood the Force as a power that’s within herself that she can learn to use to her own advantage. But it’s really a power that’s all around her, that’s already at work, that she can learn to know and lean on. The reason we struggle with Jesus’ words is that we forget that faith isn’t about ourselves at all, that if we only have faith in ourselves we’ll sooner or later disappoint ourselves — and everyone else too. Your faith isn’t supposed to be in your pick, or in the strength and skill with which you swing it, but in the God who's coming the other way to meet up with you. That’s the reason you get up every morning and grab your pick. God is coming, and you can bet that he’ll meet you at lot further than halfway along the road. That’s the kind of faith that enables a woman to get up every morning and care for her husband as Alzheimer’s inexorably takes him away from her. It’s the kind of faith that strengthens a couple to care for their autistic child, though they know the usual expressions of love between child and parents will be few and far between. It’s the kind of faith that inhabits a missionary far from home, a writer casting his words out into the world, a hurt wife offering forgiveness to her husband without knowing where it might come from. It’s the kind of faith that allows regular people face their own deaths with bravery and hope. Faith makes us believe that the impossible is possible because God is already at work, and that if we’ll just get to work too we’ll see him directly. We have to get to work on the road, but the job isn’t ours alone. Faith is the trust that you can keep going, working, digging, praying, speaking, hoping — because God never stops. Faith is what opens our eyes and hearts to his possibilities. I don’t know all the mountains your path will cross. I don’t know what obstacles you’ll have to overcome in your life. There will be some, I’m fairly sure of that. They’ll be significant. And when you come to them, when it’s time for you to start chipping away at them, please remember the hope you have: that God is just there on the other side. That he’s chipping away at them too. That soon there’ll be a road where that mountain once was. How can I be so sure? Well, that is the good news: that God moves mountains for his children. In Christ, at the cost of his own life, he went to work to carve out a place for us through sin, sorrow, pain, and death. What mountain is so large, what hill so steep, that a God like that will not level it for us if that’s what it takes? You’re not Jalandhar Nayak. You’re the town. God is Jalandhar Nayak. So grab your pick and get to work.